In Part I of Simultaneous Conversations in Education, we offered a brief review of a conversation about what the completion agenda means, the concerns it raises, and how we can make it work for the students we serve. It brought up many questions, none of them easy to answer. In Part II, we examine a second article, titled Defending Liberal Education: The Essential Questions. 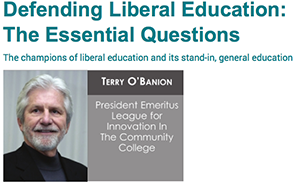 Terry O’Banion, President Emeritus for the League for Innovation in The Community College, asks some provocative questions about how we frame the value of liberal arts education. Reminding us that General Education requirements are designed to ensure at least a minimum liberal arts learning experience, he suggests that the issue of “remapping” educational pathways uses language that can often obscure our well-meaning intentions of what Liberal Education can offer. This is especially true if we are to communicate the value of the liberal arts to other stakeholders such as leaders from business and industry, or parents, legislators, students, or even vocational faculty. The questions he addresses come under five major categories and are not meant to offer answers, but provoke further discussion on the meaning of liberal education. The categories, along with a sampling of the questions are shared below. Who am I? Where am I going? What difference does it make? What are the basic talents and skills I have that can translate into a good career? What are the rewards for working that are important to me? What is my dream job? …what kind of educational experiences will it take to get me there? When I die what do I want my family and friends and coworkers to say about the work I have done? How much do I understand and appreciate being a citizen of a major democracy? Through what means can I make a difference so that I leave my country better than I found it? What are my most creative urges and talents that could produce something worth sharing with others? To what extent have I been exercising those urges and talents? How do I, or can I use art, music, dance, theatre, poetry, etc. to enrich my life? Which of these do I like most and why? What do human beings around the world old most in common? What is my responsibility for my fellow human beings? What contributions am I making or planning to make to improve my family, friends, school, workplace, etc.? In starting the conversation with these “essential questions,” O’Banion also invites your participation by asking you to send your suggestions for improvement to the categories and questions he shares in the article to: obanion@league.org.